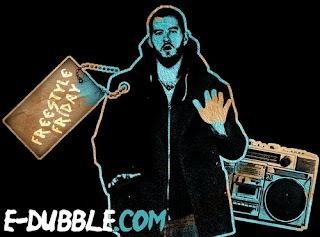 The last week or so I have posted two tracks from producer/rapper e-dubble and for those who never heard of him before, they were thoroughly impressed with his skills. Not only were people enjoying his tracks, but it seemed many in the Internet world are showing their support, which is awesome. For those who have missed the story, e-dubble has been releasing a new freestyle track every Friday for 52 weeks, he even released a 53rd last week, which was said to be his last of that series. Anyway, each track continued to be impressive both musically and lyrically, especially considering each week he was pumping one out to the masses. His music used samples and original stuff with his sometimes intense lyrics, but each song is a banger. So give e-dubble your full attention and support. Find him on Facebook and Twitter. Listen and download to his freestyle Friday tracks below (click the down arrow to get the track). He also released a album on iTunes called Hip-Hop is Good, which you can purchase here.